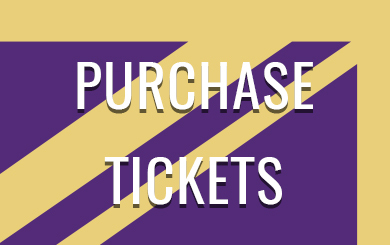 Saturday evening saw our Louisville City FC go toe to toe with the Bethlehem Steel. The weather was, for the most part, on our side. 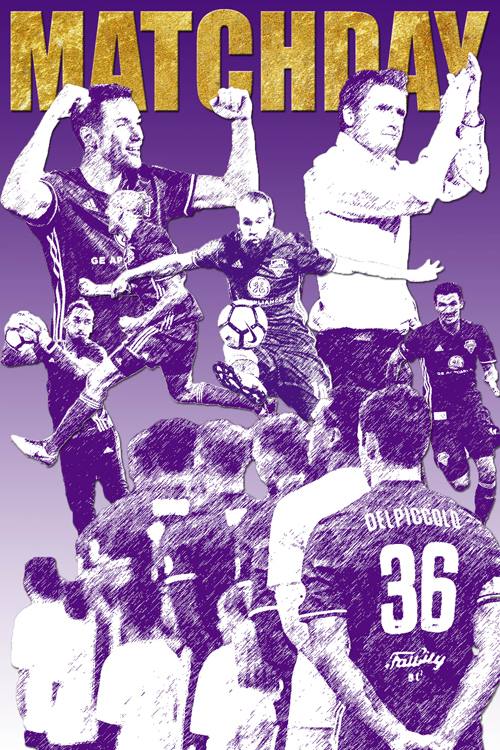 A full Patio Deck witnessed an eventful 1st half which saw our Louisville City score 3 goals in front of Scouse’s House courtesy of Cameron Lancaster and Ilija Ilic, and they would prove to be more than enough. I love touring the tailgates. Beyond just the delicious food and drinks, you can see a plethora of soccer colors on display. Without even looking for them, I could see jerseys from at least a dozen different teams; Man United, Liverpool, Everton, Arsenal, Spurs, England, Brazil, Barcelona & Louisville City to name but a few. The people of this fair city have begun to embrace the world’s beautiful game. Soccer was topic du jour in every conversation I heard. Inside the grounds and out in the parking lots. Before the game and after. Everyone wanted to talk soccer of all stripes. I heard debates about who would be in the starting eleven for LCFC. But also, there were conversations about the English Premier league, the MLS, European soccer leagues and of course the FIFA World cup. It warms my heart to see football from around the globe building traction here in the states and in Louisville in particular. More and more, there are knowledgeable fans clamoring for details about their favorite teams and leagues. And while those fans may consider terms like “relegation” and “Europa League” old hat, there are plenty of casual and new fans who are just diving into the minutiae of world football. The month of May will see many critical matches played in our very own living rooms live on TV. We will see who will be promoted, relegated, or crowned champions and Cup winners of their respective leagues. In this blog I will try and explain to many of the beginners to soccer what this all means. Perhaps the most relatable league for the beginner fan would be the English Premier League, or EPL. They use the system called promotion and relegation, or pro/rel to reward the best teams in lower divisions and punish (maybe… encourage to do better) the worst teams in the upper divisions. 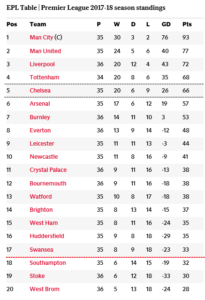 The top two divisions of English soccer are called the Premiership and the Championship. I have attached the current standings in each of those divisions. 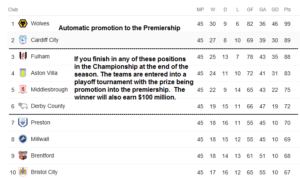 All of the teams in the bottom 3 positions in the Premier League will be Relegated (Go Down) in to the Championship and receive a parachute payment thought to be in the region of $70 million to help ease the sting of being relegated. What happens in the Championship? Whereas the top three teams in the Championship are promoted into the more lucrative Premiership. This way, there is always an incentive for teams in lower divisions (like the USL in America) to finish well in their league. Beyond just the long campaign of the regular season, there are also many trophies to be won, such as the FA Cup in England. These games are open to all of the domestic teams regardless of division and are played concurrently with the season, but with no impact on the table. The FA Cup final is a grand tradition in England rivaling the biggest sporting events in America and this year will be played on Saturday 19th May, kick off scheduled for 12.15pm at Wembley Stadium. The Final will be between Chelsea & Manchester United. The UEFA Champions League & Europa League Finals will also be played in the month of May on the 16th & 26th respectively. Those leagues are comprised of the best teams from all the best leagues in Europe. This way, fans can compare how the best of England, Germany, Spain, France, and Portugal and others would do when pitted against each other. All of the Cup Finals that I have mentioned above are some of the most watched sporting events in the World. It is thought that these events attract 500+ million TV viewers worldwide. Shortly after completion of many domestic campaigns the FIFA World Cup will begin and many of the world’s top players will converge on Russia in June 2018 to proudly play for their country instead of their club. One fascinating aspect of this is to see club teammates face one another while representing their separate nations. I intend to dive more deeply into this Tournament in my blog. All of the above finals will be televised live throughout the United States. If you didn’t want to watch these matches at home alone, there are a number of excellent places that you can enjoy them around town with fellow soccer lovers. Molly Malone’s Highlands & St Matthews, Saint’s in St. Matthews & The Mellwood Tavern all welcome soccer supporters and will show many of the teams you love. As an AVID Liverpool and Louisville City FC supporter I can tell you that all 3 locations I have mentioned have fabulous match day and game atmospheres with lots of great service, beer and food as well, but apart from that there are many passionate supporters who are lots of fun to be with. Football truly is the global sport, and I look forward to continuing to share my love for this game with the city of Louisville.